Though I’ve made almond milk, hazelnut milk for months on end over the last 11 years, and even hemp milk, pecan milk and pistachio nut milk on occasion, I came late to soy milk making. While I was intrigued long ago, the prospect seemed out of reach, since everyone who did it, and every soy milk maker I looked at was in need of large quantities at once. Since I wasn’t feeding a family, it didn’t seem practical to make a lot at once and then have to worry it might go bad if I didn’t use it in just a few days. Then there was also the fact that at some points during peri-menopause, it seemed as if a large soy intake was aggravating hot flashing I was trying to get under control. But once I entered post-menopause, that same unprocessed soy became an ally in helping to calm those hot flashes, which just goes to show how dynamic our food choices and our attention to them can be. Just last year when my friend Cathy Fisher of Straight Up Food came to visit for us to meet in person for the first time, she brought along with her what she called her “traveling milk”–a carton of EdenSoy Organic Soy Milk. This reminded me that there is only two ingredients in good packaged organic soy milk–organic soy beans and filtered water. I finished Cathy’s carton once she left, and began purchasing my own for the benefit it gave me on days I didn’t have any tofu cooked. While there is outright magnificence in living at the ocean’s edge every day, it can present practical inconveniences. One of those for me, a lifelong trash picker upper and then recycler, is that the recycling here is more limited than it is in Portland. Since there is no composting option here, I was feeling terrible about having to put so many produce scraps in the garbage, sealed up away from prying wildlife, which prompted experiments in composting in ceramic and clay pots, which, I’m happy to say, is now an up and running system and a resounding success. As one of my neighbors here can attest to, finding the best way for me to make soymilk was pretty much all I wanted to talk about for a while. 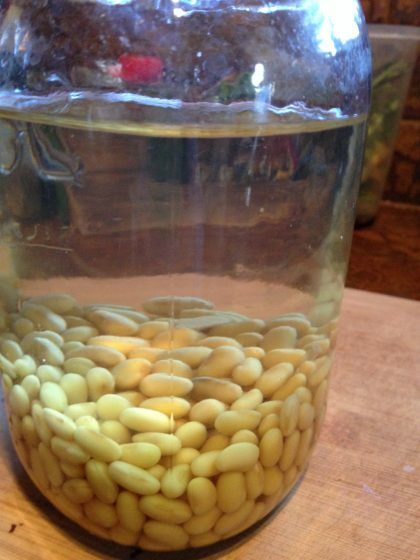 The inner alchemist in me was fascinated by the changes soaking heating skinning and simmering brought to the soy bean. And I also became absolutely entranced with finding out how many things can be made with the leftover soy bean pulp–known as okara–I could make. There are burgers, cookies, crackers, scrambles, and even pizza on my menu, all containing it. Some have been more successful than others, but it seems to be a relatively low fat nutritional powerhouse and I’m glad to have the problem of learning what I can do with it. At first the process was tiring, as I experimented with what to do and how to do it. Once I settled on a routine that is an amalgam of things I’ve read, with huge contributions from two videos on Mary’s Test Kitchen on YouTube, I could also settle into its mindful delights. Once the soybeans are soaked, it all goes from one step to the other, and each step, though they don’t take all that long, requires mindful attention. Making soy milk is not something I can walk away from or add to multi-tasking. It requires attention in the here and now. 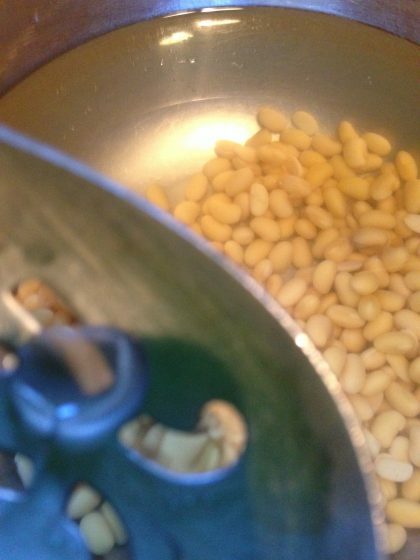 After soaking the beans in boiling water for at least overnight and up to 48 hours, the next step I like to include is running them through my hands in a bowl of filtered water to remove some of the skins. (You can read about the boiling water tip and the science behind it here.) 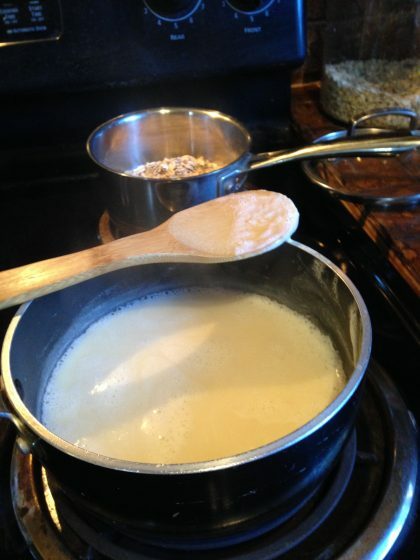 This involves skimming the separated skins off the water with a slotted spoon. At first I groused to myself about whether I was getting them all, but then I started to realize it was kind of relaxing and I actually liked doing it, if I gave myself the chance. It didn’t really take all that much time, and it was rather lovely in the northern morning light coming through the kitchen window. The next step, which I don’t have a shot of, is to spoon the (mostly) skinned soybeans into the blender and and add 5 parts water. The beauty of making the milk without a soy milk maker is that I’m able to half the recipe and make just enough for me to use on my oatmeal and so forth for the next few days. I blend those skinned soaked beans and filtered water for one minute, as I learned on Mary’s Test Kitchen. Soy Milk on the StoveThis is where the alchemy really gets magical, if I’m willing to stand there and stir and watch and wait. I’ll see the bubbles form, I’ll see the simmer begin, and I might even see the skin called yuba form (which, by the way, is delicious, and which can be removed or stirred back in. I had to learn not to turn away and wash a few dishes or try to finish something else that would distract me and of course never to leave the kitchen while that simmer is happening. But once I learned how to recognize the gentle simmer, I also learned to be able to smell when it was most likely ready to my taste. Here, finally, is the photo I took first, that inspired me to take the others. 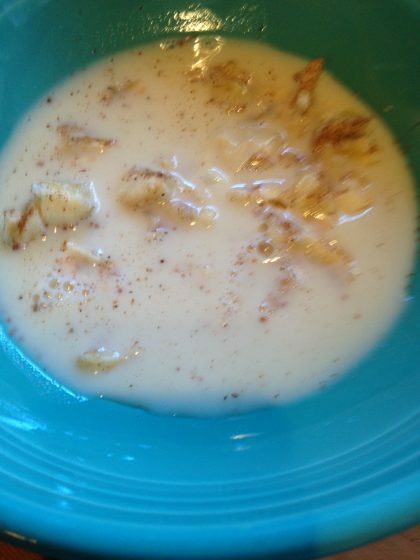 It’s the remainder of the previous batch of soy milk, poured into the bottom of my oatmeal bowl, over mashed banana and nutmeg. It was so pretty with the light bouncing off one of my favorite blue bowls that at first I thought I’d just plop it up on this blog’s facebook page. But then I realized the whole process and what a meditation it’s become was worth writing about to me. After my kids visited, I also revisited the prospect of the soy milk maker, for convenience. But when i reread the comments, I found that many who had bought one still used a nut milk bag to strain it after it came out of the machine, rather than just a mesh strainer, in order to get the quality of milk they liked best. I also learned it’s not possible to make smaller batches than 5 cups at once in any of these machines, unless I were to purchase a small one that only has a small capacity. What is the point, I thought, of enduring the noise of the soy milk maker, when I can be done with the noise in a literal minute and then listen to that delicious dripping sound coming from the patience of my own hands? I’ve also found that the soy milk itself running over my (clean) hands has softened the skin on them in a way that feels luxurious. It’s also true as others say that I really do save money making my own milk. It has cut down on what goes in the trash as well. So for now, I will continue with this quiet, relatively slow way of making my soy milk. It is much slower and more time consuming than picking a carton off the shelf (I do allow myself a container in reserve for times I need too much too quickly or am too tired to go through the whole process), but it also really is true, as everyone who makes their own says, that there’s no comparing its sweet taste and smell to store bought. And I’m talking about just the finished milk, with no sweetener added in. Ultimately, though, it’s the peaceful and beautiful magic of the process that has absolutely captured my heart. I need processes like this to anchor me in a chaotic world. I think we all do. This one literally nourishes me as well, and it takes less time and money than some would have me believe. It returns me to the deep truth that making anything is magic for me. It’s almost my religion. It’s certainly where my spirit feels most at home and can soar, yet stay anchored to the cast of the light, the shape of the bean, the color of the tile. Kitchen as temple: simple domestic grace. I love this post, Maria. I often think of prepping food and cooking as a meditation. I have made soy milk in the past, from a recipe by Maangchi. It uses the entire bean, blended, which results in an obviously different end product than the recipe you’re following! Perhaps I’ll try yours as well. Thanks for sharing this. Thanks Danielle! I do u!se the whole soybean blended but then it get strained. I didn’t see any recipes that didn’t strain–sounds intriguing!! I didn’t use the cashews or the sesame seeds or salt, just soybeans and water. We had some with kongguksu and some just to drink. It was delicious. Hopefully the link will show! Thanks for the link, Danielle. That’s an interesting way to do it. I think I may have read that in the process of my education, but didn’t want to use the nuts or seeds. Nice to know you didn’t and it was delicious anyway! Maria – this is a lovely story! I’m interested to add soy milk to our rotation. When I made it years ago with a machine, I used a soybean from Iowa. Have you found a particular variety or grower that has a good taste? I like the quantity your method produces. Thanks Barb! I have seen a lot of recommendations for Laura’s Soybeans from Iowa online. 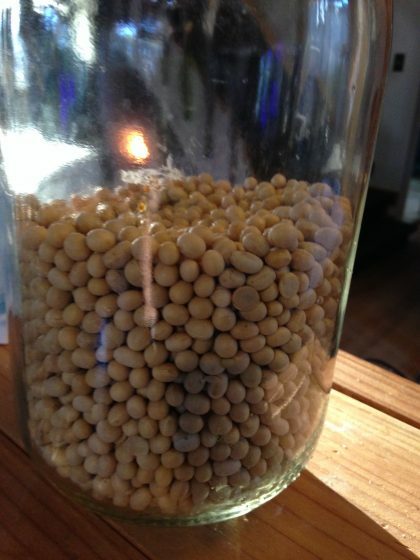 I have just been getting organic soybeans in bulk from Oceana, the food co-op in Newport in my area. They work fine for me.